Cocky and deadly, Elle Driver is an assassin that you don’t want to mess with. In fact, she’s someone you don’t want to see inside a room with you. She has amazing skills in hand-to-hand combat and sword fighting. Not to mention, she has experience with poisons as well. Elle Driver likes to wear a tight black suit, but that’s not her most iconic look. That is when she dressed up in a white nurse outfit, white shoes, a nurse’s hat on her head with blonde hair, and a white eyepatch on her blind eye. 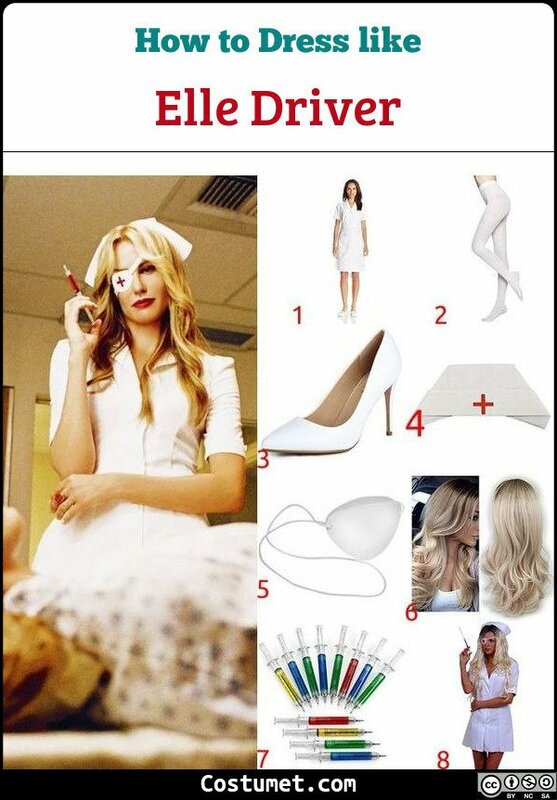 Here’s everything you need to look like Elle Driver. 1 White Nurse Dress Elle borrowed a white nurse’s dress to go undercover in the hospital. 2 White Stockings As part of the nurse uniform, wear a pair of white stockings. 3 White Heels White heels will also go well with your outfit. 4 Nurse’s Hat Wear a nurse’s hat on top of your head. 5 White Eye Patch Wear an eye patch over your eye. Don’t forget to draw a red medical cross over it. 6 Blonde Wig If you don’t have blonde hair, it might be a good idea to wear a wig. 7 Fake Syringe Elle’s weapon of choice was a syringe so bring along a fake one. 8 Full Costume Set Use this costume set for a quick and easy time. Elle Driver was portrayed by Daryl Hannah in both Volume 1 and Volume 2 of Kill Bill.